Modern-day Utah occupies a unique position in the western trails system. Because of its geography and relatively early settlement, Utah is a literal trail crossroads. The Spanish trail made a broad upward loop through Utah as it conducted travelers between California and New Mexico around the canyons of the Colorado River. Indians, mountaineers, fur trappers, traders, explorers and adventurers passed through the state on east-west and north-south routes, often leaving trails that others followed. Utah is the western terminus of the Mormon Trail. The California Trail had important alternates through Utah, the Hastings Cutoff passing south of the great Salt Lake and Hensley's Salt Lake Cutoff which connected Salt Lake City with the California Trail northwest of the lake in Idaho. Throngs of Forty-Niners as well as more conventional travelers took these routes. Emigrants bound for Oregon sometimes passed through the state. The Pony Express crossed Utah and in some places was contiguous with portions of the California and Mormon trails. The eastern and western segments of the first Transcontinental Railroad were joined here. Utah is truly a trails crossroads. DISCOVER UTAH NATIONAL HISTORIC TRAILS GUIDE VIRTUAL TOUR AT NPS! CLICK THE MOBILE MAP BELOW TO LEARN MORE. Click the Photos and Maps to see a larger image. NATIONAL HISTORIC TRAILS AUTO TOUR ROUTE INTERPRETIVE GUIDE UTAH —CROSSROADS OF THE WEST. Discover the four trails that exist within our UT chapter boundaries with a "National Historic Trails" designation-by federal law. They are California, Oregon, Mormon and Pony Express. Learn about the pioneers and their perilous journeys as the traveled the trails through UTAH. 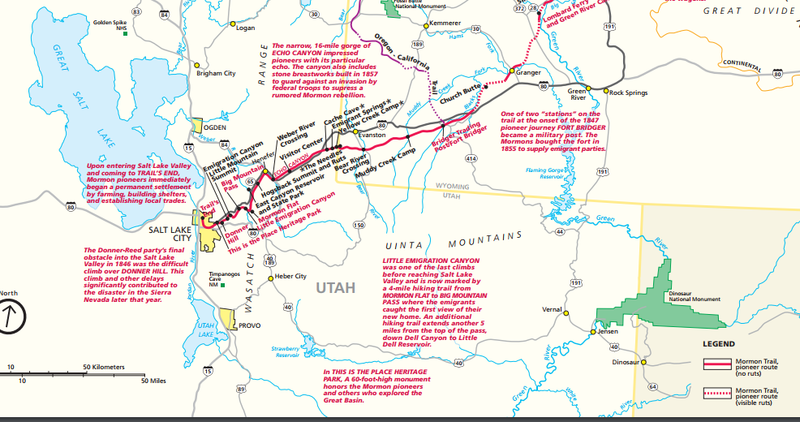 The Utah Auto Tour Route Map accompanies the Auto Tour Route Interpretive Guide. Utilize the Auto Tour Route Interpretive Guide for the Oregon Trail! Plan your trip and download the Oregon National Historic Trail Topographical Map and check out the Interactive Trails Map Viewer at NPS! Discover Interactive Maps for all of the trails at the National Park Service website. Discover driving directions to follow the Pony Express National Historic Trail west through Utah at NPS. Plan your trip by downloading the Pony Express National Historic Trail Topographical Map and explore the trail with the NPS Interactive Trails Map Viewer. An Exodus - The Mormon Pioneer Trail: Few years in the Far West were more notable than 1846. That year saw a war start with Mexico, the Donner-Reed party embark on their infamous journey into a frozen world of indescribable horror, and the beginning of the best organized mass migration in American history. The participants of this migration, the Mormons, would establish thriving communities in what was considered by many to be a worthless desert (NPS.) In addition, 4 small groups came through the Salt Lake Valley taking what is known as the Hastings Cut-off across to the Humbolt River. In 1847, the Mormons came in large numbers. Download or view the PDF map at NPS to see details of the Mormon Pioneer Trails and read about their journey along the trail. Once the map is accessed, click the + sign repeatedly in the bottom left corner to enlarge the map. View the Hensley Salt Lake Cutoff Trail Documentary and learn all about the Bidwell/Bartleson Trails. The California Trail had important alternates through Utah, the Hastings Cutoff passing south of the great Salt Lake and Hensley's Salt Lake Cutoff which connected Salt Lake City with the California Trail northwest of the lake in Idaho. Most California emigrants went north of Utah to Ft Hall on the Snake River. They cut southwest crossing through a few miles of what is now the northwest corner Utah. Discover Utah History to Go for more information about the the pioneers who traveled the Hensley Salt Lake Cutoff Trail.